The astronaut husband of wounded Congresswoman Gabrielle Giffords – faced with the tough decision of whether to command his upcoming space shuttle mission or to remain by his wife's side as she recovers – is expected to announce his decision today (Feb. 4). Giffords (D-Ariz.) is recovering from a bullet wound to the head that she received when a man opened fire at a constituent meeting Jan. 8 in Tucson, Ariz. 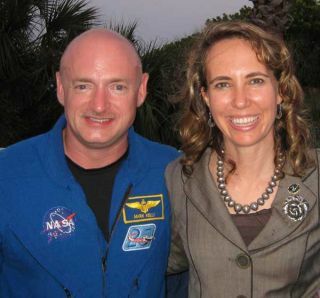 Her husband Mark Kelly was slated to lead the upcoming STS-134 mission of the space shuttle Endeavour, due to launch April. 19. NASA will hold a news briefing this afternoon to discuss Kelly's decision. He will be joined by Peggy Whitson, chief of the astronaut office at NASA's Johnson Space Center in Houston, and Brent Jett, chief of the flight crew operations directorate. The briefing will be broadcast on NASA TV at 3 p.m. EST. Early rumors suggest Kelly will go forward with the mission. Yesterday (Feb. 3), Politico, the Arlington, Va.,-based political newspaper, reported that a source familiar with the decision indicated that Kelly will fly on Endeavour's flight. Kelly has confirmed that his wife is making steady improvements in her recovery. "Every day she gets a little bit better and the neurosurgeons and neurologists tell me that's a great sign," Kelly said Thursday (Feb. 3) at the National Prayer Breakfast in Washington, D.C. Earlier, NASA appointed veteran astronaut Rick Sturckow to serve as a backup commander during training for the STS-134 mission, which is the final flight of the space shuttle Endeavour. Kelly's twin brother, Scott Kelly, is also an astronaut and is currently onboard the International Space Station's as the commander of the Expedition 26 mission.